Myrrh has always loved the esthetic of early electronics. Silicon Valley bus map and vacuum tubes mounted on wood. 8" X 15" X 3"high, 1 lb 8 oz. 10” X 12”X 1” deep, 1 lb. 2 oz. 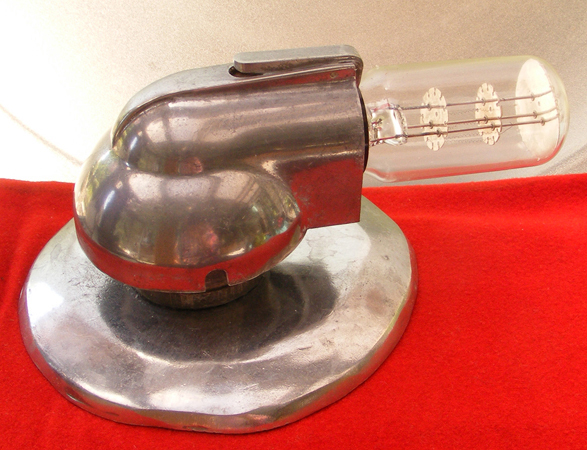 Rectifier vacuum tube atop a candle holder embellished with jewelry. 4.5" high, 2" diam., 9 oz. A box of circuit boards in a deep box. A hidden fluorescent light plugs in. 14" X 14" X 5" , 6 lbs. 13" X 10" X 1"
8" X 2.5" diameter, 1 lb. 10" X 12”, 1 lb. 2 oz. 5.5” X 1.5” diameter, 9 oz. Ceramic star. Small circuit board hides in a mechanical device. Mounted on a stone base. 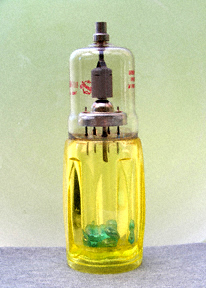 Nixie vacuum tube, mounted on a lladylike Japanese soda bottle with strands of beads. 9.5" X 2”, 1 lb. 5" X 7.5" X 4" high, 12 oz. 6" X 3", 8 oz. appr. 11” high, 5” diam, 1 lb. 8 oz. 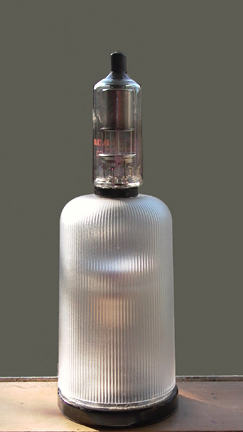 Ion gauge tube, into which the artist has inserted a silver heart. Carved wood base, silver collar. Electronic parts, including a miniature disc drive, metal and plastic. 6” X 8” X 2”, 9 oz.